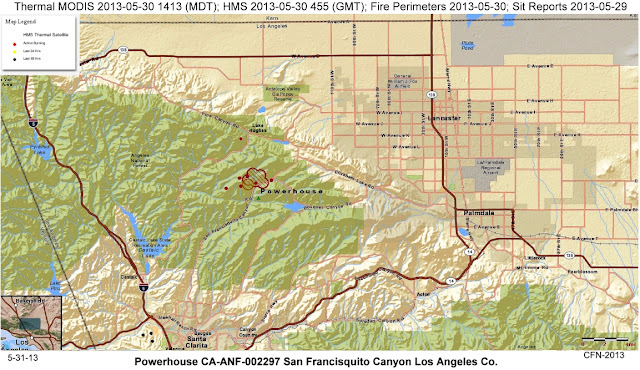 CA-ANF-Powerhouse - CA-ANF-002297 San Francisquito Canyon Los Angeles Co.
Update: 6-1-13 Noon: LASD Deputies evacuating 41600 block of Lake Hughes Rd north of Mendenhall Probation Camp. Evacuation orders remain in effect for as many as 300 homes in Green Valley. CALIFORNIA: DRAMATIC PHOTO FROM #POWERHOUSEFIRE AS ITS SPREADS TO MORE THAN 5,500 ACRES. EVAC ORDERED. 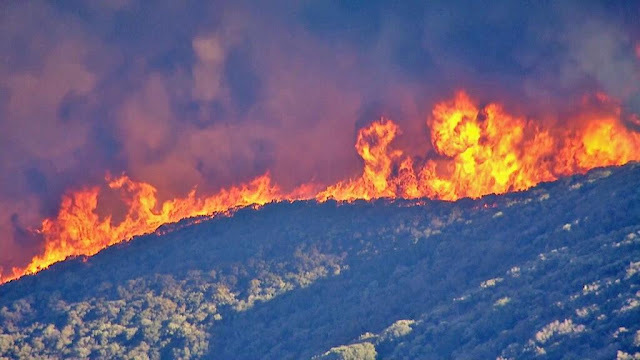 The Los Angeles County Sheriff’s Department along with the LA County Fire Department are in the process of evacuating Camp Mendenhall Probation Camp and areas north of South Portal Road and West of San Francisquito Canyon and due to the “Powerhouse” brush fire. The fire has burned 1,400 acres and is now moving northbound toward Lake Hughes Road. Approximately 600 Firefighters are on scene fighting the brush fire as well as assisting with evacuations. At this time the brush fire is 15% contained with no reported injuries or lost structures. A Red Cross evacuation center has been set up at the Marie Kerr Park, located at 39700 30th St. West, in the City of Palmdale. The Evacuation for large animals has been set up at Antelope Valley Fairgrounds (Gate 3), located at 2551 West Avenue H, in the City of Lancaster. Check with Santa Clarita Sheriffs Dept. for information specifics at (661) 255-1121. Evacuation center located at Marie Kerr Park, 39700 30th st, Palmdale. under a hard closure. 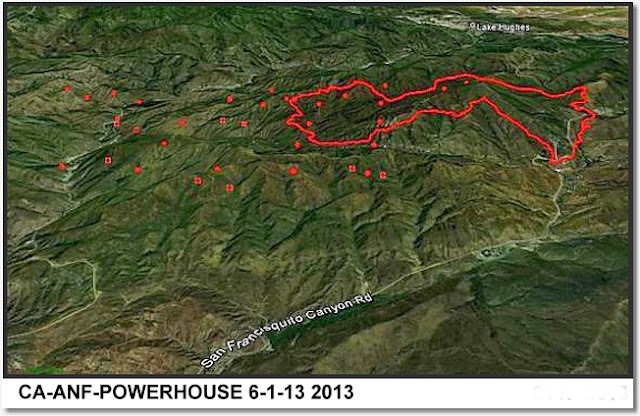 Bouquet Canyon Road is under a soft closure open to residence only. Elisabeth Lake Road is under a soft closure open to residence only. Smoke: Local health officials warned that air quality in the Santa Clarita Valley and San Gabriel Valley mountains will be unhealthy for sensitive individuals throughout the weekend due to the fire, and they urged residents to take precautions and stay indoors if possible. "In all areas of visible smoke or where there is an odor of smoke, all individuals are urged to be cautious and to avoid unnecessary outdoor activities," said Dr. Jonathan Fielding, director of public health for Los Angeles County. 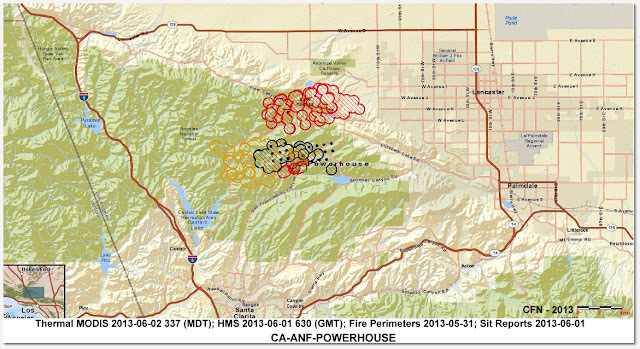 Update 6-2 0001 POWER HOUSE FIRE - CA-ANF-002297 - 15,000 to 20,000 acres, jumped California Aqueduct well-established north of Lake Elizabeth Rd, LA County Fire Copters 14, 16, and 19 and LA City Fire 1 are night-flying on this fire right now. Air Attack stayed over the fire until 2330 hrs. Update 6-1 2130 Rough assessment of 8 structures lost 50 still imeadiate threat. The patch of brush currently burning last had fire in 1924 according to the CAL FIRE FRAP data. Approximately 1200 structures affected. 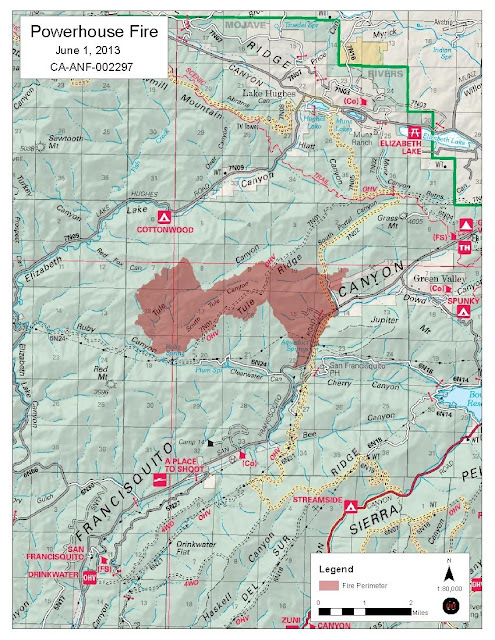 Additional evacuations along Lake Hughes Road were put in place including two youth probation camps and Cottonwood campground. Air Attack just clearly blamed loss of Castaic dip for the loss of Lake Hughes Rd and the fire getting away from them. Said, "We lost Castaic, had to redirect to Bouquet which created a traffic problem, and everything boiled up after that. "Anyone else listening to the radio traffic. Air attack complained about rubberneckers in boats interfering with the helicopters picking up in Lake Hughes. Asked for a patrol boat to help shoo them away.What happened instead? Whoever is in charge of Lake Hughes forbade them from picking up water in the lake and they had to redirect all helicopters to Bouquet Reservoir. Splitting between the two bodies of water had allowed them to establish an orderly traffic pattern. Using only one reservoir creates a logistics nightmare. Bureaucracy run amok! !Update 6-1 1415: RRU ST 9310C responding. 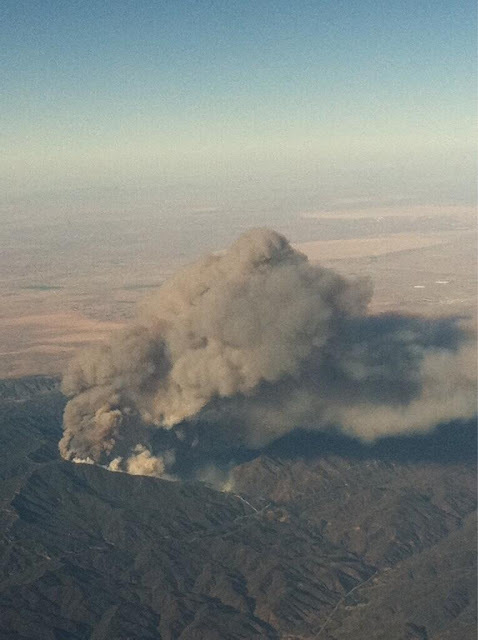 Update 6-1 0700: Fire has burned 3662 acres, 15% contained. *Estimated Containment is June 5, 2013. Hot, dry weather & 500kv power lines pose concerns. 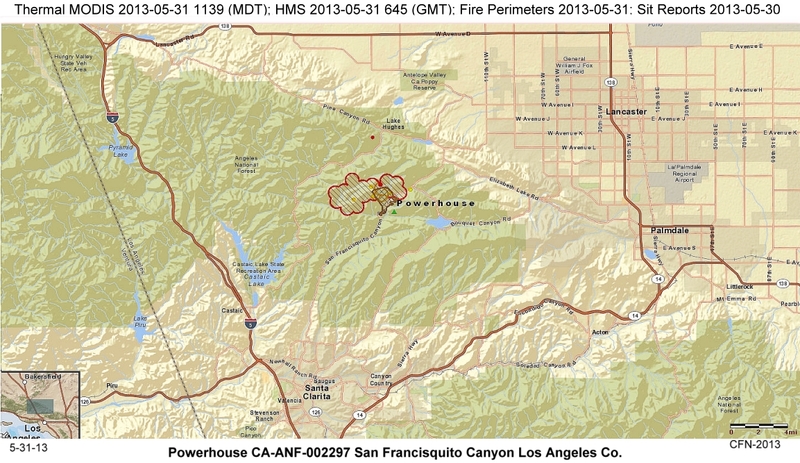 Fire made a major run to the west and north under moderate winds and very dry temperatures. Additional evacuations along Lake Hughes Road including two youth probation camps and Cottonwood campground. 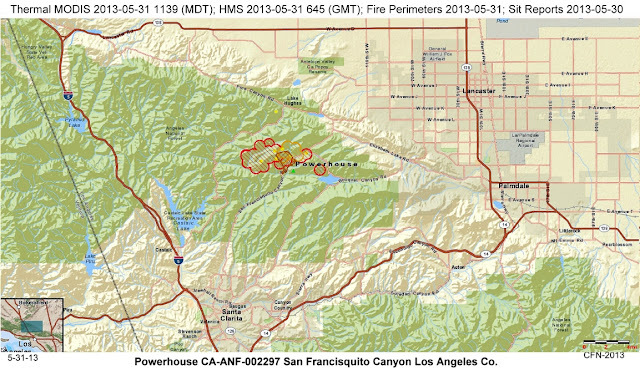 Remarks: Areas along Lake Hughes Road were evacuated including Cottonwood Campground and two youth detention camps. 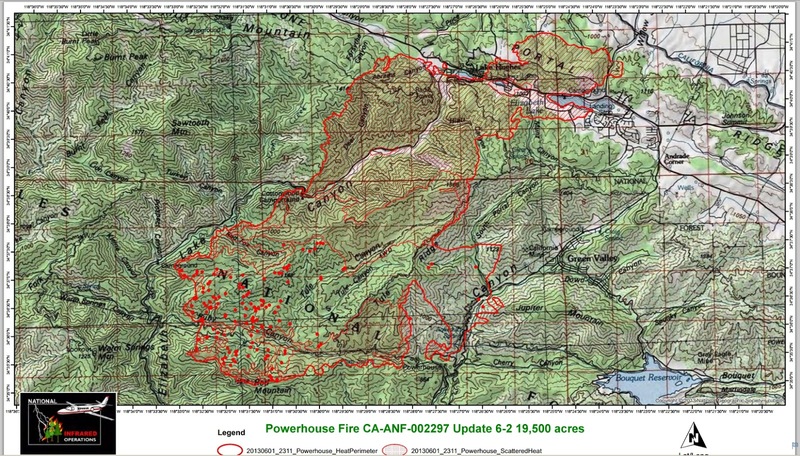 Edison is very concerned about a 500kv transmission line that could be threatened by the fire. Due to heavy smoke unable to gather accurate fire perimeter estimated fire size could be 2000-2700 acres, fire will be flown by IR tonight and a more accurate perimeter will be available in the morning. 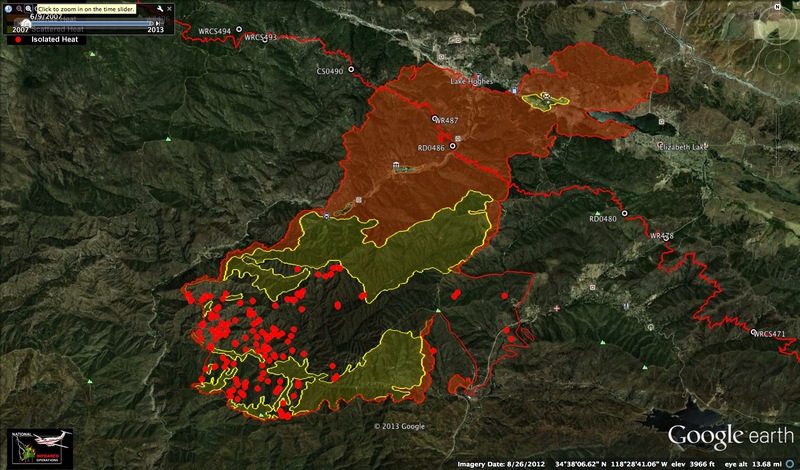 Observed Fire Behavior: Rapid rates of spread with a high resistance to control efforts. Fire exhibited moderate to long range spotting in receptive fuels and winds from the NE. Update 5-31 1930: 1804 acres, 15% contained. Update 5-31 1630: 2500+ acres, 15% contained. AREA WILL CONTINUE TO BRING WARMING AND DRYING TO THE REGION ON FRIDAY. THE TYPICAL UP CANYON WINDS THIS EVENING ARE EXPECTED TO SHIFT TO THE NORTHWEST AND INCREASE BETWEEN 10 PM AND 4 AM. THE SURGE OF NORTHWEST WINDS IS EXPECTED TO KEEP CONDITIONS DRY ACROSS THE BURN AREA TONIGHT WITH POOR HUMIDITY RECOVERY EXPECTED. THE LOW LEVEL FLOW WILL WEAKEN AND TURN AROUND TO THE NORTH DURING THE EARLY MORNING HOURS...BEFORE SHIFTING TO THE NORTHEAST BY MID MORNING FRIDAY. THIS NORTHEAST FLOW WILL BRING RAPID WARMING AND SEVERAL HOURS OF SINGLE DIGIT HUMIDITIES ON FRIDAY. Update 2200: A Type 2 Fire Incident Management Team has been ordered to manage the fire. The Fire will be turned over to team est. 6:00 a.m.
Update 1845: 1000 acres evacuating community of Green Valley, fire moderating now backing 1/4 mi from South Portal Rd.Walkers type II team activated. 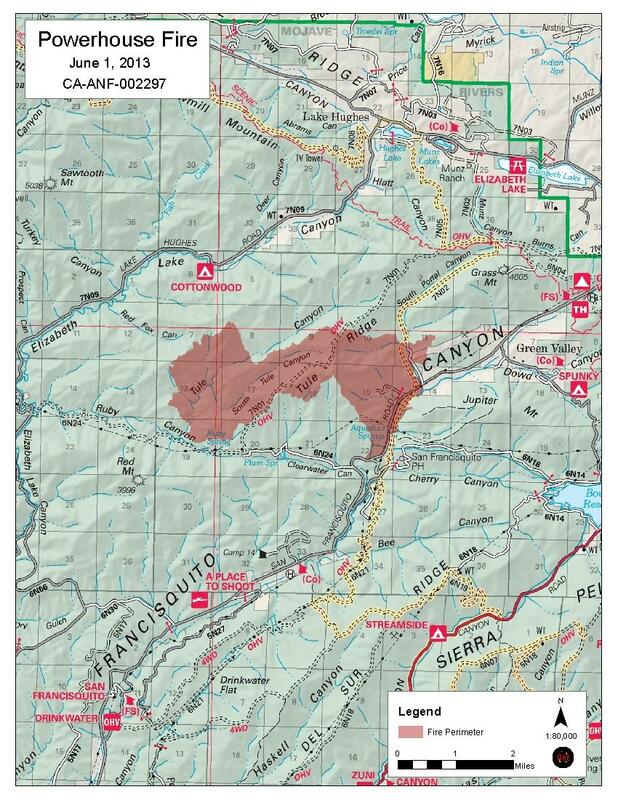 LAC C-11 Searching for 4 hikers 7 mi east & 1 hiker 1 hr west of Green Valley area unsuccessful so far #CaSAR Total of 14 hikers in the #PowerhouseFire area. Five rescued, one not in distress. Search for eight more underway. Note: Per USFS PIO "They are having the sheriff's department lift the evacuation order for the residents of Green Valley however all evacuation centers will remain open for the night"
Los Angeles County Sheriff Department in Palmdale confirmed that a limited 5:30 a.m. evacuation was ordered for a number of homes on San Francisquito Canyon Road in Green Valley and on Thursday, evacuations were lifted at 10 p.m. for about 200 homes in the area. LAC Emergency Code 3 move ups, Large header visible in area. 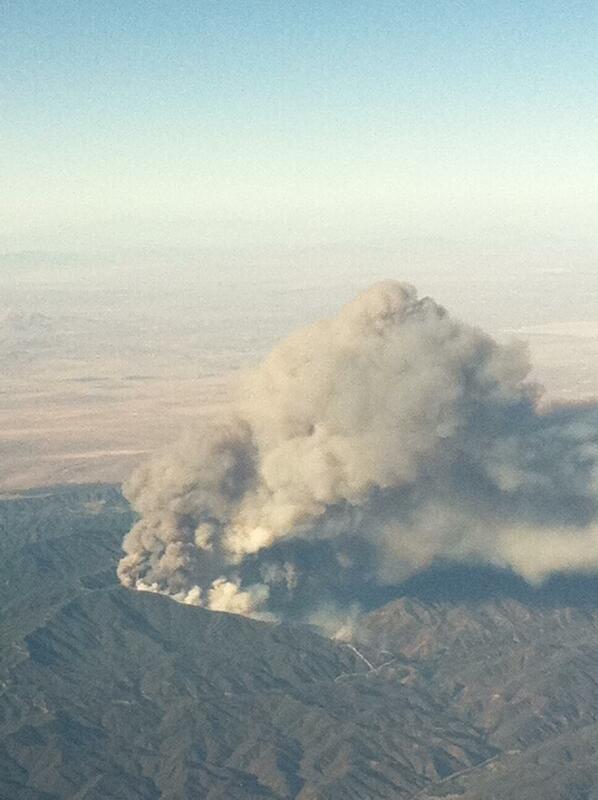 Update 1645: 400 acres. Evacuations in Green Valley. IA: The blaze broke out at about 3:30 p.m. Thursday just north of Powerhouse No. 1, a hydroelectric plant near the LA aqueduct that has been operating for nearly a century. ROS: Rapid extreme fire behavior with long range spotting. ROC: Powerlines down, spotted across San Francisquito Road.